what is the actual performance scale from that overclocking compered to stock clocks? I'm getting two new 680s when availability stabilizes, i'm using my EVGA Step Up from my 480s, I have a question for you, I take it you're using two PSUs to power your four cards, I've never done that, can you tell me how to synchronize two PSUs? Thank you very much! And once again, great score mate! Thank you for requesting a free High-Flow bracket for your GTX 680! We have shipped your bracket on 3/29/2012, via USPS from Brea, CA. Enjoy your new card - game on! I was able to score the free brackets! @15th Warlock, you just need a Dual Power Supply Adapter to run two PSU's. Thanks MetalRacer, I've been contemplating this question for a while now, as I'm in queue for my step up as inventory is very limited right now, but I'll get this adapter while I wait for EVGA to send me the new cards. Or else, what kind of sorcery is this?! 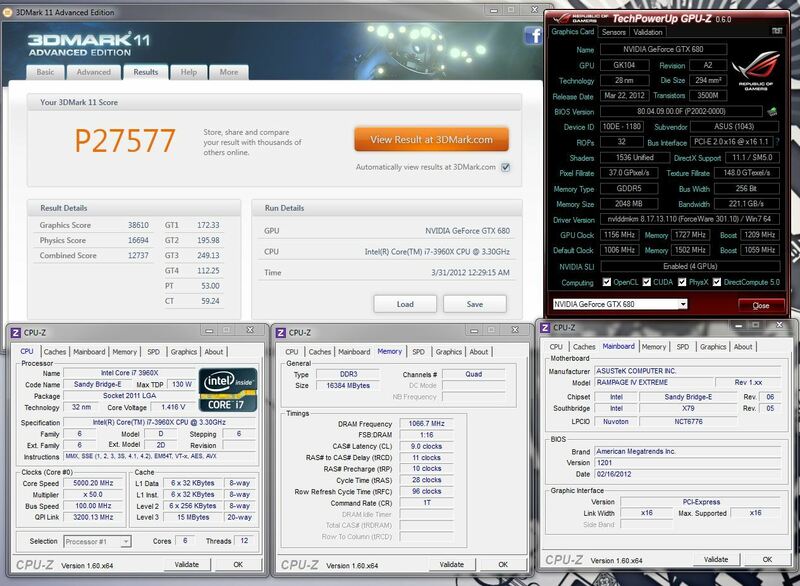 According to my test on a 3960X based testbench a single HD7970 at about stock gives around 7700 GPU score, about 8800 at 1125MHZ. Don't necessarily need the adapter. Can do it by combining pins 14(green - pwr on) and 15(black - ground) leading from the mobo to both psu's. did you turn off tessellation ? and set everything to performance ? Question what are you turning off to make such a big difference in scores??? I thought this bench was supposed to be run using default driver settings, that's how I run mine every time, am I wrong?